I thought this movie was pretty good. Based on the book about Mark Zuckerberg’s rise to power, “The Accidental Billionaire” the Social Network has a good story, which is filled with drama and suspense. Not something I expected from this film but it was present and made the movie flow. What I really liked is how smoothly the story moved from Mark Zuckerberg’s beginnings at Harvard, all the way to the construction of an empire known as Facebook. What drives a 19 year old to become a billionaire by age 23? Drive, determination, and focus. Zuckerberg is hard to read in this movie. You never know what he has in mind or what his next intentions will be throughout the film, but, his role is filled with revenge, dark humor, conceit, and flamboyance. Jesse Eisenberg gives us a good performance of Mark Zuckerberg in The Social Network. 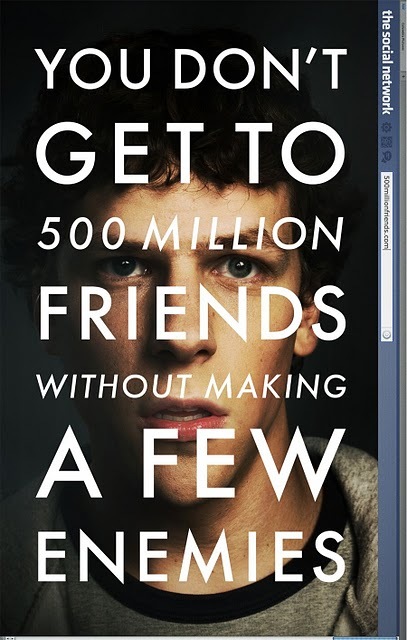 Zuckerberg is depicted in the movie as a motivated, power hungry fueled geek. If this is how he is in real life I can see how he came to be a billionaire so quickly. He took a solid idea, (and based on the movie, ideas from others) and banked on it. I have watched a couple of videos online of the real Mark Zuckerberg and his cohorts. The real Mark seems…. “seems” like a completely different soul than in the movie. As always, no spoilers but I do highly recommend seeing this film. I enjoyed it. Go pick it up, rent it, borrow it, but definitely check it out.